I took a ride up and down Hutchinson Island today trying to find a beach that was fishable. I looked at Blue Heron, Middle Cove, Walton Rocks,Hermans Bay, Normandy, Bob Graham, Tiger Shores, and Stuart beach accesses. I am sorry to report that the weeds have made wetting a line almost impossible and with the updated forecast of a building surf, it looks like its going to be a tough weekend. The only good news is , once we can fish again, the water color looks great. The sandfleas were on most of the beaches I checked and I did come home with a nice bucket full that I boiled and put in the freezer. I also wanted to let everyone know about a great promotion that Fishbites will be running at BassPro Shops in Port St Lucie, on Saturday, Oct 27. The Fishbites Company will be setting up a tent in the parking lot to display all of their products. They will be doing a "Buy 2 Get 1 Free" sale on their baits . If you buy two bags of Fishbites in the fishing department, you can take your receipt out to the tent and receive a bag free. Their staff will be in the tent displaying all of their current products and some great new baits that are just hitting the market. As everyone knows , I do not go to the beach without a couple bags because they catch everything. I will be spending time both in the fishing department and outside in the tent to answer any questions you may have about fishing this great product. The pompano season has kicked off already so what a great time to get some extra bags of Fishbites for the upcoming season. In the St. Lucie Inlet and along the docks in the St. Lucie and Indian Rivers it is still game on for snook. Guides are reporting regularly getting their clients hooked up with slot-size keepers and some huge 40-inch plus fish. They are mostly catching them using live baits including mullet, croaker and some pinfish. Anglers fishing for snook are also catching trout and redfish as bycatch. There have been some nice triple tail caught along the channel markers. At the Roosevelt Bridge good-size tarpon are being caught. Anglers working the schools of mullet with artificial lures along beaches in Jupiter are catching good numbers of snook. 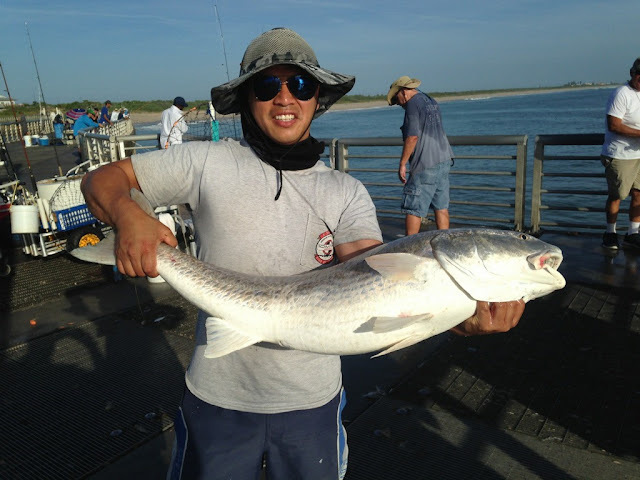 Fly fisherman in the same areas have been reporting catching ladyfish. 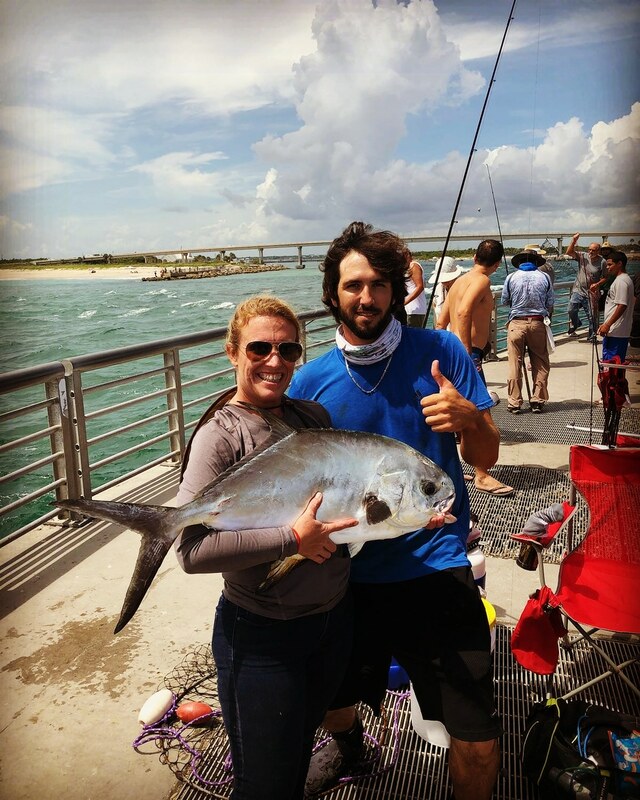 Fishing at the Jupiter Inlet is producing a huge variety of fish the past week. Anglers are catching Spanish mackerel, snook, jack crevalle, mangrove snapper and even a few keeper muttons. There have been schools of mullet moving up into the Loxahatchee River and anglers working them have been catching snook, jack crevalle and even a few redfish. Anglers at the Boynton Inlet have been catching a lot of southern puffers off the south jetty using frozen, cut shrimp. The north jetty has been producing snook, mangrove snapper, jack crevalle , barracuda and permit on a variety of live and cut bait as well as artificial lures. The Intracoastal Waterway has had schools of baitfish moving through, mostly glass minnows and mullet. 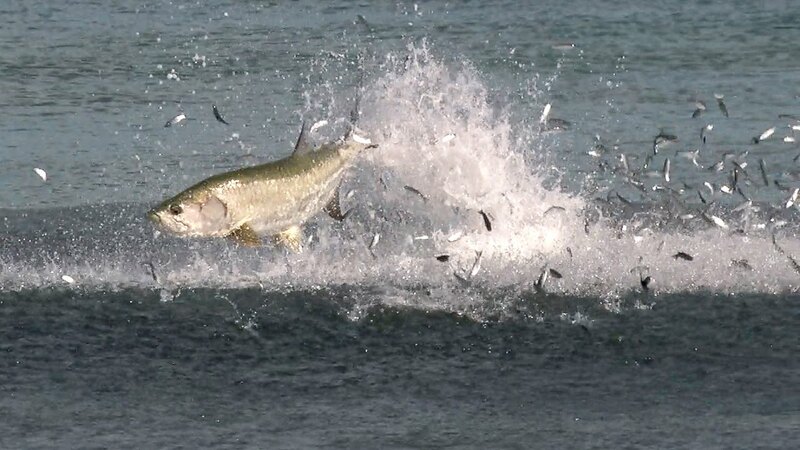 There have been a lot of tarpon rolling along the channel edges and bait schools being chased by jack crevalle and snook along the shorelines early in the morning. Lantana Bridge anglers have been catching jack crevalle, snook, sand perch and a few redfish using live shrimp and cut mullet. 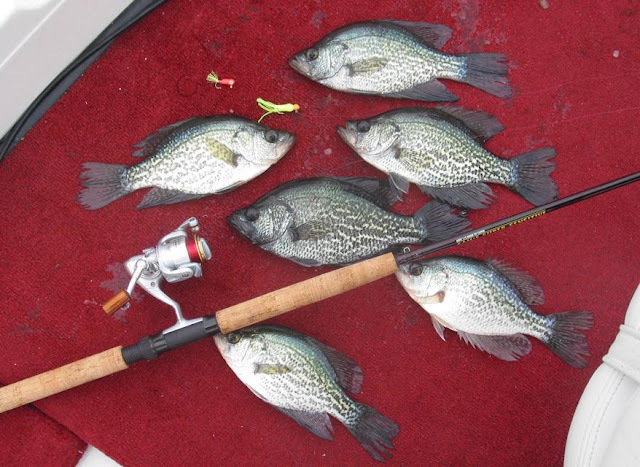 The fishing the past week has been pretty good on both live bait and artificial lures. There are a few big bass around to be caught and it will keep getting better as the water begins cooling down next month. The artificial bite has been good using Gambler Aces and Zoom Super Flukes. Inshore the snook bite has been good around the dock lights and a few around the bridges on the outgoing tide. The trout and reds have been to the north of north bridge in the bait schools live mullet and top waters such as the jumping minnow have produced the best. The water is still warm the trout bite should be good as soon as the water cools off. INSHORE- Snook fishing remains very good inshore right now. Look for the snook to be keyed in on eating mullet right now. The bridges are holding a good number of snook, especially on outgoing tide. The snook are also hanging around boat docks and seawalls that are good ambush points. Live mullet will be a solid bait choice; while those preferring lures will find success throwing Yo-Zuri Mag Darters and Hydro Pencils. Expect a few tarpon to be mixed i with the snook as well. SURF/PIER- The Juno Beach Pier had good action again this week on an assortment of species. Spanish Mackerel, blue runners, jacks, and snook have all been biting well at the pier. Still been a good number of small baits around at the pier, so be sure to have some small sabikis. The bobber rig has been working well for the spanish mackerel. Should still be a good number of mullet coming down the beach so be ready....everything else will be with them! Why This TINY Fish Means Something INSANE is About to Happen! Inshore the mullet are starting to show up with some snook and nice trout to the north of north bridge live mullet and top waters have produced the best. The bridges have been good at night with jigs and live bait on the outgoing and a few snook in the inlet. 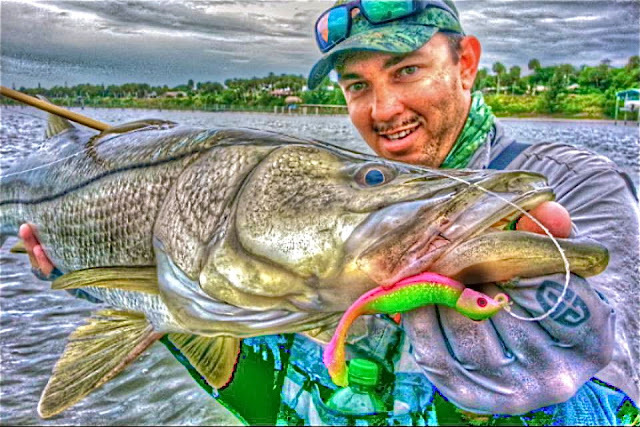 The jig bite should pick soon so stop on in and get ready we have First light and snook snatchers it should be a great fall season as soon as we get some cool weather. The beach fishing has been good find the bait and you should find the fish. According to our friend Sarah at Sebastian Bait & Tackle, there have been a lot of nice slot Snook at the beginning of the outgoing tide. A few Redfish off the North Jetty too, mostly on cut bait, shrimp, croakers and mojaras. 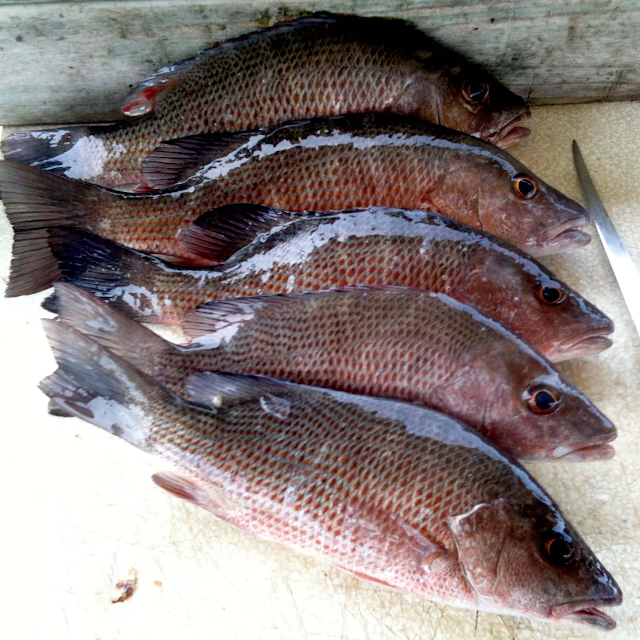 Throughout the day a good number of Mangrove Snapper and we have had reports of a few Cubera Snapper too. Live shrimp and greenies are working well. 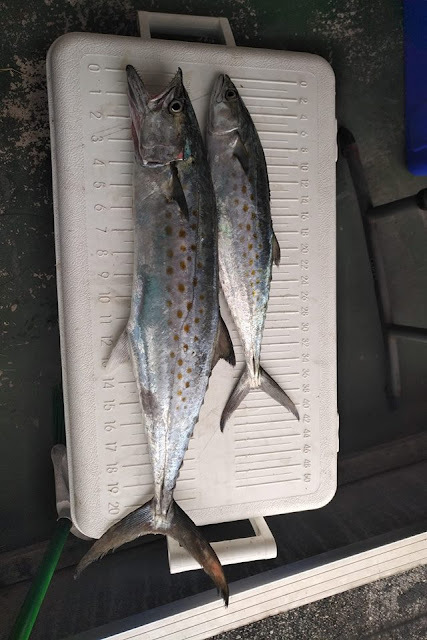 Throw a got-cha lure for Spanish mackerel. Please remember to pick up after yourself and clean up trash. A big thank you to Tung Pham from Orlando for sending in this pic! He caught this beautiful catch & release 42” Red with live mullet at the end of the North Jetty. Big swells, dirty water, and weeds are back along our coast and things are pretty well shut down if you are targeting any fish from the surf. Looking ahead at this weeks predicted winds and wave heights I would like to tell you that things are going to get better , but it doesnt look that way. Acoording to my Windfinder app Wednesday and Thursday are the only two days where the wave heights are going to be under four feet . They are forecast to go back over six feet through next Wednesday. The shame of this weather is the pompano started to really chew last Friday as my wife and myself caught our recrerational limits and threw back another 20 plus during the day. We fished at Middle Cove and EZ Flea Fishbites and live sandfleas accounted for all of the bites. Whiting, jacks, blue runners , and ladyfish all made an appearance also during the time we fished. A positive note for anyone who likes to round out their bait supply during the pompano season is the presence of sandfleas that are avilable to rake up and down our beaches. I have found good numbers at Stuart, Tiger Shores, Normandy, Bob Graham , and Middle Cove , so if you want to boil some and put them in the freezer, they are readily available. I guess we just have to be patient and hope the forecasts are wrong . Good luck and catch em up. Some big macks out today (not the McDonald's kind). Water was murky green and choppy. Very windy with some strong currents at times. Lot of decent Jacks, some blue runners (some really big) and lots of macks in all the sizes. Also saw a fair amount of lady fish coming over the rails. Bobber rigs and live bait free lined were the tools today and yesterday. Yesterday I caught about a million blue runners. The mullet are starting to push through the ICW, and the snook have been close behind them. Tarpon, jacks, and a few redfish have also been following along with the mullet. It's easiest to find the mullet early/late in the day or at night. Boat traffic tends to put them down a little deeper, and makes them harder to find. The predators tend to take full advantage of the mullet coming to the surface during lowlight periods of the day. Live mullet fished on the outside edges of the school is the way to go if your into live baiting. For lures try a Yo-Zuri Mag Darter or Hydro Pencil, Zara Spook, or Rapala X-Rap. The flats around Hobe Sound and Munyon Island are starting to really come to life as well with the mullet showing up. SURF/PIER- The mullet run reports are starting to come in more frequently. 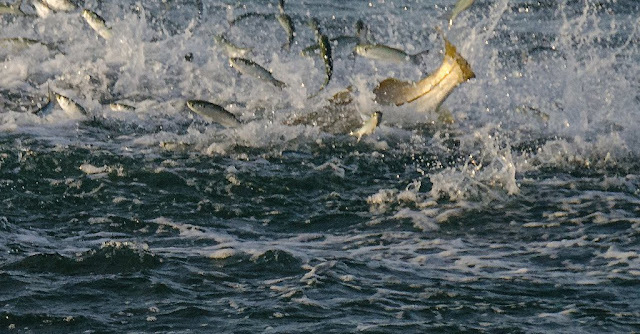 The first arriving schols of mullet have been holding a lot of tarpon and snook. Best bet on fishing the schools is to try and find them early and late in the day. The predators tend to take advantage of the lowlight conditions and feed best/most then. Unlike inshore fishing, fishing the schools at night doesn't do much. The mullet tend to break up a bit and move offshore at night, making them harder to catch. The Juno Beach Pier has been producing a fair number of Spanish Mackerel and blue runners over the past week. Still decent size schools of sardines hanging around, so be sure to take plenty of red #3 sabikis. 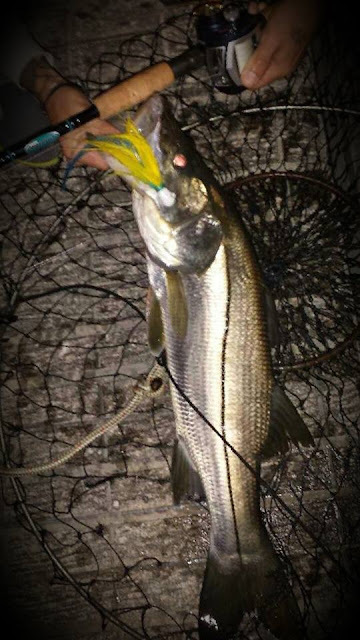 Jupiter Inlet is still holding a nice number of snook, with the best bite seeming to go off just before sunrise. In the Jensen Beach area, it’s all about snook. They are being caught at the St. Lucie Inlet and in both the St. Lucie and Indian Rivers along the docks. They are mostly being taken on live bait. Anglers fishing the bridges at night, however, as the mullet are moving through, are having excellent luck working the shadow lines using MirrOlure Top Dog and Rapala Skitter Walk lures. Anglers fishing for snook are also catching a few huge sea trout as bycatch. There are some serious ‘gators’ out there with one charter captain catching one that was 28 inches. There have been some big tarpon cruising the area as well so keep a rod ready. D.O.A. Bait Buster and TerrorEyz lures are working well. 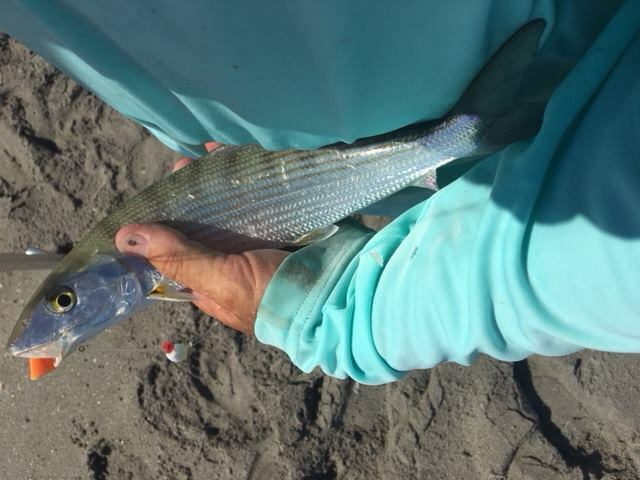 In the Boynton Beach area, the mullet have started migrating down the coast and surf anglers are reporting good fishing in the early mornings throwing top water plugs like Zara Spooks and Yozuri Poppers around the schools. They are catching snook, tarpon, jack crevalle and barracuda off the Lantana and Delray beaches. 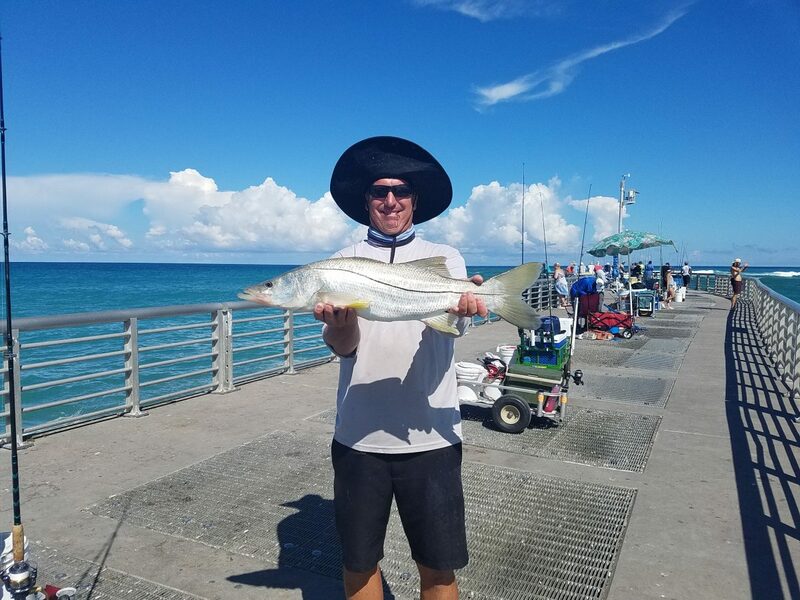 Boynton Inlet anglers are catching snook, tarpon, mangrove, dog and cubera snapper, as well as barracuda, jack crevalle, redfish and permit. Whole live mullet or sardines are working on the snook along with bouncing feathers along the bottom at night. Redfish are eating cut mullet as are the cubera snapper. The Intracoastal Waterway has mullet moving through and slow trolling live mullet along the channels and docks has been producing hits from snook, tarpon, jack crevalle, barracuda, and small sharks. Mangrove and cubera snapper up to 15 pounds are hitting jigs tipped with jumbo live shrimp around the rock piles, bridge fenders and shallow artificial reefs. Similar to the past few weeks, the early morning bass bite is still excellent along the east side of the King’s Bar area. Anglers working the edges of the Kissimmee grass from dawn until about an hour past sunrise are having excellent luck using white swim jigs. After that switching to a beaver- or craw-style artificial bait and pitching around the buggy whips and cattails is producing good results. The speckled perch bite has continued to pick up. Jigging using white or white/chartreuse jigs from the surface to five feet in the Little Grassy area, some anglers are catching their limits of these prized pan fish. We have been dealing with a big population of catfish along our local beaches since the swell began from Hurricane Florence. Add the factor of some off-colored water and that equals to a very unproductive surf day. If anyone has attended my seminars or read my posts about targeting pompano, I always state the two biggest reasons folks don't catch this fish is (1) you aren't reaching them, and (2) you are fishing in water that isn't the right color. I tried a few beaches this week on Hutchinson Island and found the catfishing great but little else was eating the Fishbites, sand fleas, or shrimp. This morning I changed things up and headed to Hobe Sound to fish the Bridge Road beach and boy, what a difference! The water was the nice "clean green" color that I love for targeting pompano and they did not disappoint me. Pompano, bonefish, ladyfish, bluefish, and yes, a few catfish, provided a few hours of non-stop action. 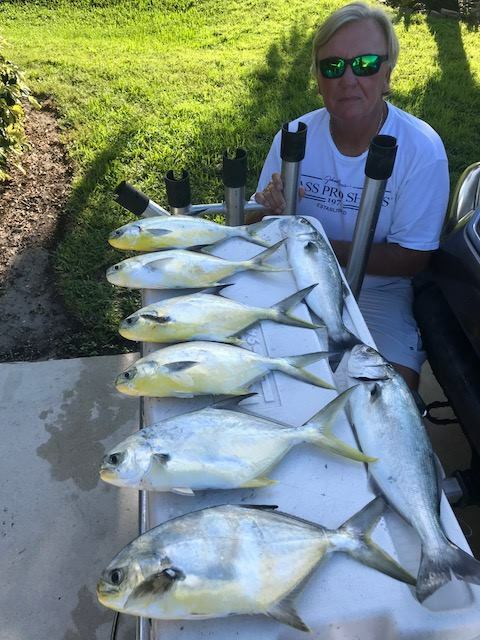 I had my recreational limit of 6 pompano and at the end of the morning was throwing back keepers for other anglers to catch. The real surprise was the number of bonefish that took a liking to the EZ Flea Fishbites. The tally for that catch-and-release species was was 7 with a couple of larger fish that really took off down the beach. The total number of fish collectively bending my rods today was probably around 40. Any time you can hit the surf and experience that kind of activity, it's a great day. Until our water starts cleaning up on Hutchinson Island, take the ride to Hobe Sound and fish either the Bridge Road access or the National Wildlife Refuge Park. Good luck and catch 'em up. Big Snook & Redfish combo! Fishing the Flats w/fishing727! Jetty Giants Fishing and Redfish!!! The heat of September continues along the Treasure Coast. Expect hot, humid days throughout the rest of the month. We have had a light breeze most days to take the edge off the hot weather for us. Rains continue each afternoon. We got deluged by Tropical Storm Gordon this past week. What can you expect.....it's the rainy season. The glass minnows have been flooding into the river, which is normal for this month. They are a favorite food for fish and fowl. Look for jacks, ladyfish, mackerel and bonito to be feeding on them around the inlet. It's a fun month for fishing the inlet areas. We have had some nice size mackerel lately. Small, shiny lures the size of the bait will help you have some fun! It won't be long before the fall mullet run begins and that will be another active time on the Treasure Coast. Snook season opened on September 1st so check your licenses and permits before you get out to catch that slot fish. It's good idea to check you tackle, rods and reels this month and make sure everything is in good working order. Early mornings has been the best trout bite with top water or DOA shrimp. Fish grass flats two to five feet deep for best results. We have been catching a number of snook along the mangroves. All have been under slot, but a good fight since they are out of season anyway. Top water, CAL paddle tails or DOA shrimp will all work on snook around the mangroves. Redfish have also been under the mangroves staying out of the sun. Skipping your lure or bait under the mangroves is essential to getting a bite. I like to use the CAL paddle tail to skip under the mangroves. They are under the shadow lines and you have to get back in there if you want a bite. Snapper have been all over the river and many have been keepers lately. Docks, bridges and channel edges have all held good numbers of snapper. It has been a good year for snapper in the river. 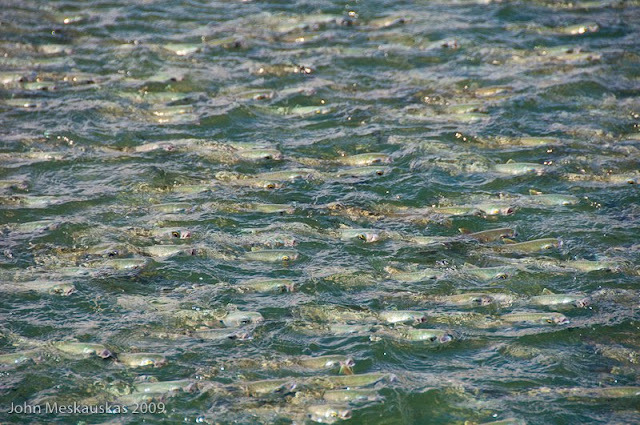 The inlet has been invaded by ladyfish, jacks, blue runners and other hungry species looking for an easy meal. Look for the glass minnow schools and you will find plenty of action, especially for the kids! Have fun and be safe out there! Went to visit with Sarah this morning at the Sebastian Inlet Bait & Tackle. She reports fishing has been GREAT so grab your gear and get out there! Early morning on the North Jetty, anglers have been bringing in lots of Snook, mostly oversized, on croakers, mojarra and shrimp. During the day, some Spanish Mackerel have been biting on got-cha lures on the oceanside. A fair amount of mangrove snapper on the south side with greenies and shrimp. Off the North Jetty all day, snook and redfish galore with live shrimp as the name of the game. A shout out to one of our regulars out there, Jim who caught this snook off the North Jetty. Light southeast winds expected through Thursday with highs at 91 degrees most days. Clear days earlier in the week with scattered thunderstorms probable on Friday. So, be ready for the mullet schools to show up in the next few weeks as they will be migrating South. Usually, with the first early fall storm as the water gets really choppy and murky close to shore the bait starts streaming out of the inlets and starts to make the move down our beaches. Not sure if it is a mechanism that allows for a greater chance of avoiding predators. But, I am pretty sure from past history that the mullet run may start during the next few weeks as this approaching series of off-shore storms could be the spark that gets them going. Frank Lo Preste on casting. My First Time Fishing Sebastian Inlet. How'd I do? 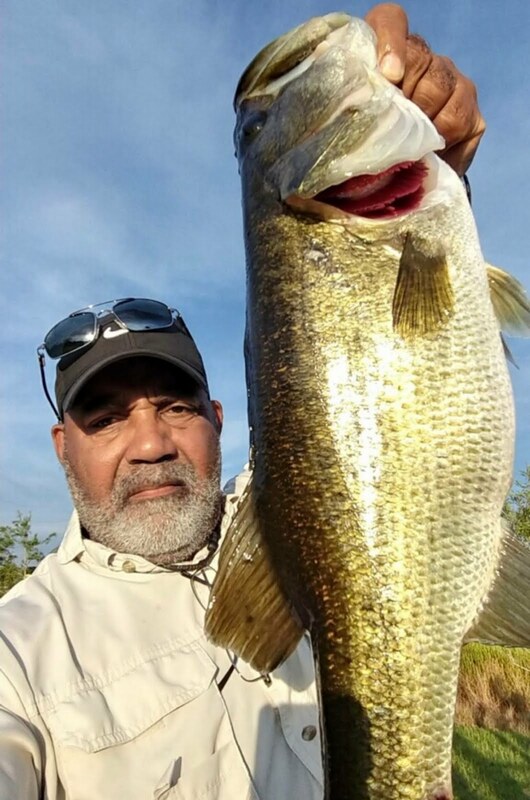 A big thank you to our angler of the week for submitting this photo! 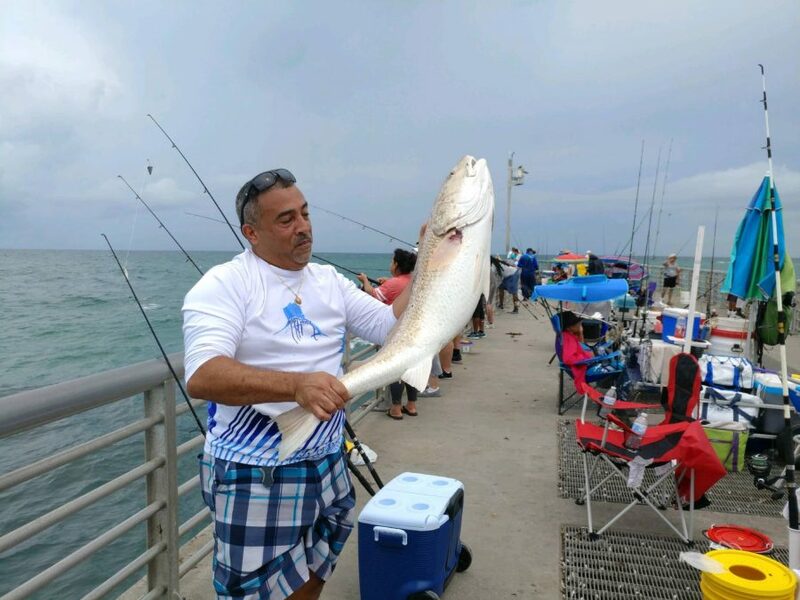 Felix Quiles of Tampa came to visit the Sebastian Inlet State Park last weekend and caught this beautiful Red off the North Jetty. Lingering weeds and the start of a building swell from Hurricane Florence forced me to reschedule my charter this morning. I was already up at Tiger Shores so I met my son Randy and his father-in-law Barry Rashkin on the beach but the swell and lack of fish had us looking at other beaches. Disgruntled reports from other fishermen regarding the swell and a lack of anything but catfish had us heading to Middle Cove beach access to try our luck for the short time we had left to fish. 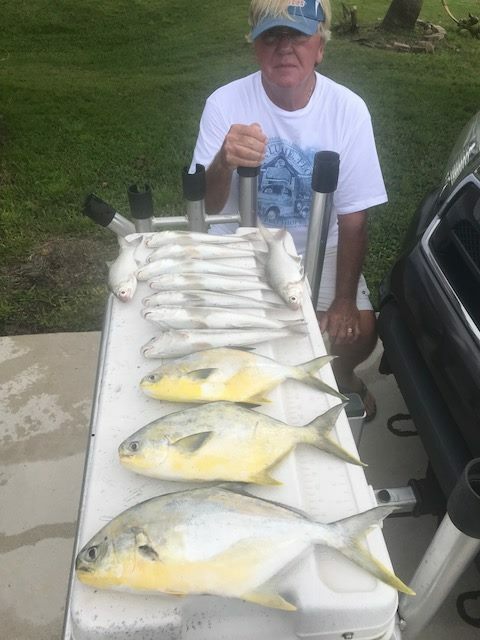 I have stated in previous posts that the Labor Day weekend time period is when I start targeting early season pompano, so we decided to fish a couple of long rods to test my log book. Last season Irma short-circuited my plans in early September, and the water color today was not the optimum clarity we were looking for. But sometimes you just have to trust previous results and that worked today as we put three nice pompano in the cooler along with some whiting. The pompano favored the EZ Flea Fishbites and the whiting hit the orange clam scent. The key to catching the whiting today was to have your baits 50 - 60 yards from the edge of the surf; the pompano were in their usual spot of 70 -100 yards off the beach. Local surf regular, Clint Blackwell was fishing just north of me and he had a great catch of whiting. I also received a text and a picture from friend and expert angler, Justin Colton, whose message was " get ready, here they come". Justin is located in Vero Beach and his video contained a school of mullet getting hammered at his beach this morning. Before we left we spotted some nice schools of mullet making their way down the beach and the first spinner shark to go airborn 100 yards off the beach. We are going to have to deal with a big swell event from Florence this week but when the surf subsides, hopefully by next weekend , we could find some great surf fishing with pompano, tarpon, snook, big jacks, mackerel , and sharks as they start moving down the beach. The current forecast has Florence heading to the Carolinas, so let's keep those folks in that area in our thoughts. It looks like the Surf Fishing The Fall Mullet Run Seminar couldn't be coming at a better time, so I hope to see everyone at Bass Pro Shops in Port St Lucie next Saturday, September 15th at 3:30 pm; and 2 pm at Bass Pro Shops in Dania Beach on Sunday September 16th. Monday, Tuesday, and early Wednesday look fishable so good luck and catch em up. 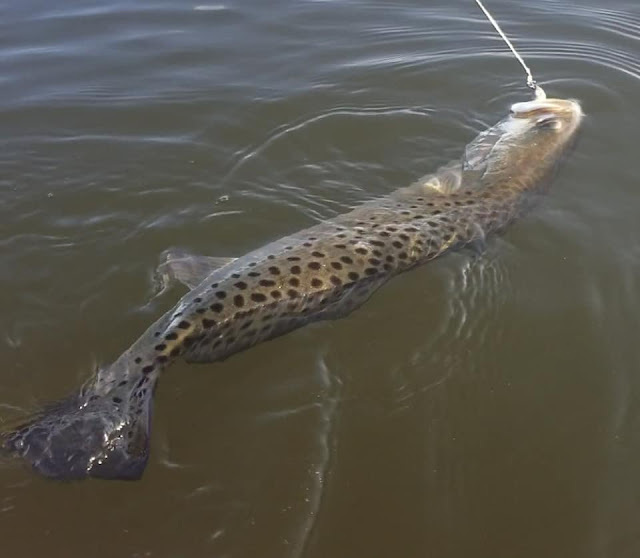 In the Jensen Beach area, anglers fishing the east side of the Indian River near the powerlines have been catching some nice size trout. MirrOLure Top Dog and Rapala Skitter Walk lures are working best. In the same area, but on the west side anglers working the docks have been catching a few redfish and black drum. There are still snook biting at the St. Lucie Inlet and they are mostly hitting live baits including croaker, mullet, bunker and greenies. If you can find a spot free from seaweed there are still some tarpon to be caught along the beaches. At the Jupiter Inlet and along the beaches in Jupiter the name of the game is snook. Anglers working the beaches from the Juno Pier to the Jupiter Inlet and from Blowing Rocks Preserve up to Hobe Sound National Wildlife Refuge in the early mornings are having a blast catching these prized fish. Best bets are Rapala’s X-Rap lures, 1 to 1.5-ounce Red Tail Hawk jigs and 1.5-ounce spoons. If working the inside of the inlet Red Tail Hawks are the way to go. 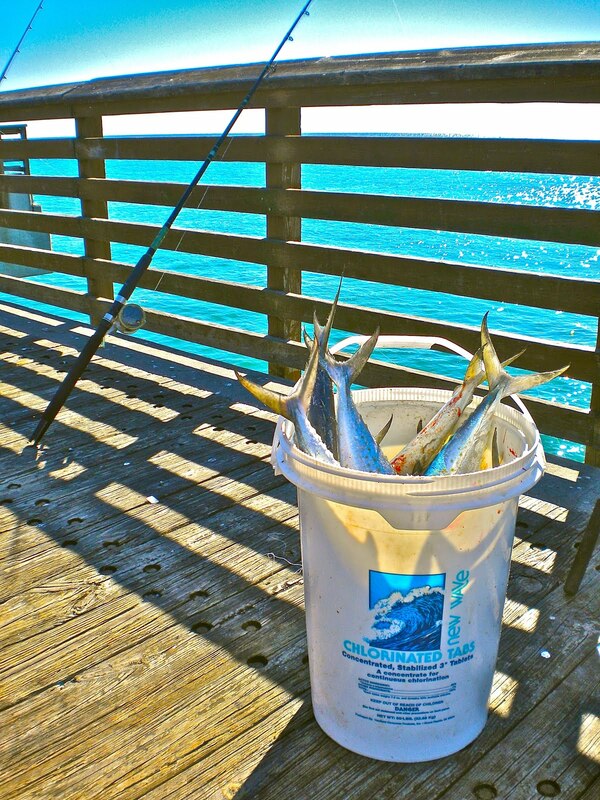 At the Juno Pier they recently had a good run of Spanish mackerel and pompano. Anglers should keep an eye on Hurricane Florence. If it stays on track it could eventually send a decent groundswell from the north, which will likely push the finger mullet schools that are currently up around Sebastian down to us. This will bring in more game fish and should further boost the already good snook bite. At the Boynton Inlet there has been a good amount of bait around. Anglers are having decent luck catching keeper-size snook using chicken feathers and Flare Hawks and also using live croaker. There have been some nice-size tarpon along Beer Can Island. Anglers working the Lantana Bridge are reporting catching lots of sand perch. There have also been lots of tarpon and snook stealing those sand perch before they can be reeled in. Bridge anglers targeting snook are doing well at night working the shadow lines with Flare Hawks. The bass bite is still good and has been best in the early mornings and evenings using spinner baits and swim jigs. Live shiners are working well for the mid-day bite. Hot spots recently have been from Buckhead Ridge over to the Tin House Cove area as well as Indian Prairie to Horse Island. Anglers working the rim canal, near the J&S area are having good luck on bass using crankbaits. There is still a decent bluegill bite happening in the rim canal. 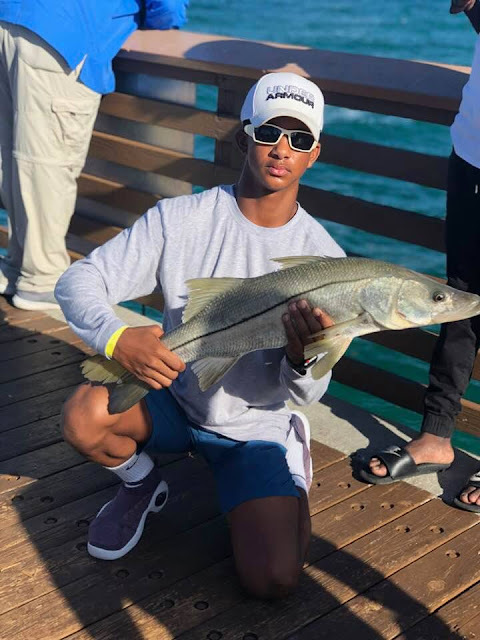 Lots of excitement abound this weekend on the North Jetty for the kickoff of snook season as is evidenced by our friend Ed Killer’s front-page reporting for the Indian River Press Journal, the Florida Today and more. Go to TCPalm.com to see his videos.